Here is volume 2 in the planned three-volume set (correction: now planned four-volume set) from Hendrickson that continues the promising start we found in volume one. 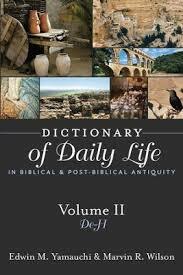 This volume continues to live up to its stated aim of giving us insight into the daily life of Bible times with articles that cover what is often missed in other Bible dictionary or reference volumes. As one who owns several Bible Dictionary or Bible Encyclopedia sets, I found things covered well here that were little covered in larger volumes. Written on a level that any Bible student could comprehend, this book is still backed by impeccable scholarship. Looking at every subject in the chronological order of OT, NT, the Near Eastern World, the Greco-Roman, the Jewish World, and the Christian World is especially ideal and enlightening. Some of the most fascinating subjects in this volume include dentistry and teeth, divorce, dwellings, hair, and heating and lighting. In the article on divorce, for example, you will find information that may not match everything that you have heard. In the one on dentistry and teeth, you will simply be glad you did not live in Bible times! There are even a handful of color pictures at the end. This practical resource will be a blessing to any Bible student or pastor, and I highly recommend it and eagerly anticipate the final volume.